Pineapples are low-calorie, nutrient-rich tropical fruits native to the Caribbean islands, and to Central and South America. The Spanish introduced them to the Hawaiian Islands, which has become the primary producer of pineapples sold in the U.S. One serving of fresh pineapple provides 44 percent of the daily requirement of vitamin C, for adult males and 53 percent for females. 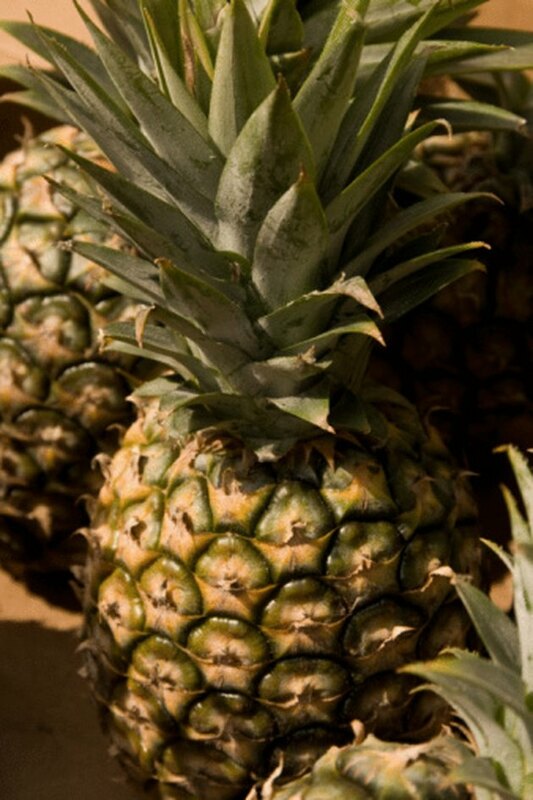 Pineapple also has iron, potassium, calcium and fiber, according to the U.S. Department of Agriculture. Broiling and grilling fresh pineapple caramelizes its sugar and enhances its natural sweetness. Pineapple must be boiled before it is combined with certain ingredients. Leave your fresh pineapple on the table for a day or two to allow it to ripen. Turn the pineapple upside down in an empty container for a few hours before you cook it to distribute the sugar throughout the fruit. Cut the leaves off the top of the pineapple, then peel it with a serrated knife. Remove any eyes with a paring knife. Use the serrated knife to slice rings of pineapple 1/2 to 1 inch thick, starting at the top. Separate the core from each slice with the paring knife by cutting around it in a circle. Make pineapple chunks, if desired, by cutting each slice through from the rim to the center. Heat a stovetop or outdoor grill to medium-high temperature. Combine lime juice, oil, honey and spices in a small bowl and mix with a fork or wire whisk. Thread pineapple chunks onto metal skewers. Brush chunks or slices with the spice mixture. Place each slice or skewer on the grill with the seasoned side facing the fire and cook for 4 to 5 minutes. Baste the other side, turn and grill for another 5 minutes. Line a baking sheet with aluminum foil or brush with oil to coat. Put pineapple chunks or slices on the sheet. Turn the broiler on and place pan on an oven rack about 2 inches from the flame. Turn the pineapple when it is golden brown, after about 1 minute. Remove from the oven when the other side has browned. Brush each skewer or pineapple slice with lime juice and sprinkle on the spices of your choice. Put fresh pineapple chunks in a pot and cover with water. Bring the water to a boil and cook the pineapple for 3 minutes to deactivate the enzyme that prevents gelatin from setting. Drain and cool before adding to a gelatin mixture.